The coloured-leaved Dracaenas are exceedingly numerous, and as table plants they are much admired. 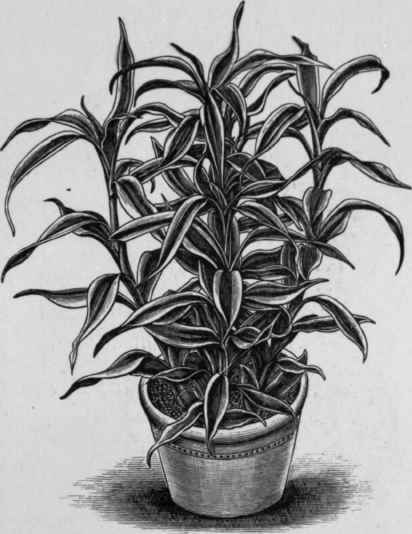 They are essentially stove plants, and need considerable care in their culture, as the loss of a single leaf will often destroy the symmetrical character of a specimen and greatly depreciate its value. The members of this section are increased in different ways. The best plants for propagating purposes are those with tall naked stems. Such as these may have the top removed and inserted as a cutting in a pot of sandy soil. The stems may also be cut up into lengths of 3-4 in., laid in a bed of coconut fibre, and be covered to the depth of ½ in. ; while lastly the underground rhizomes, or "toes" as the propagator terms them, may be treated in the same way. It is essential that the bed of coconut fibre should have a fair amount of bottom heat, and stove temperature must of course be maintained. From the buried stems young shoots will be pushed up from every joint, and when they are large enough, and have formed roots of their own, they may be potted singly. A mixture of equal parts of loam, leaf mould, and peat, with nearly a part of sand, will suit these Dracaenas. When shifted into 5-in. pots a little more loam and a sprinkling of bone meal will be beneficial. Even after they are shifted it is an advantage to keep them plunged in a gentle bottom heat. Good old varieties still worth growing are Cooperii and terminalis, while of others may be mentioned angustifolia, Jamesii, Lord Roberts, Lord Wolseley, Prince Manouk Bey, and Sanderiana (fig. 279). D. deremensis War-necki is a graceful new variety having arching leaves 12-18 in. long, 2 in. wide in the middle, with a conspicuous white stripe on each side. Other kinds are Godseffiana, with elliptic golden-spotted leaves; Victoria, broad leaves striped green on a yellow ground; Goldieana, pea green striped with dark green. Fig. 279. - Dracaena Sanderiana.